Over/Under: Under 147.0 at 1.90 Bet Now! This is the last round of fixtures in the regular season of the Euroleague and these teams are heading in different directions after this game. This is because the hosts are heading into the playoffs and there is still a chance that they can gain home advantage, but they need other results to fall in their favour. The away side has endured a torrid time this season and they are dropping out of European competition, so this will be their last European match of the campaign. These teams are familiar foes and they have clashed on 21 occasions in the past. The Catalan club has come out on top 16 times but it was the Turkish side that grabbed the away win when these teams met earlier on in the campaign. The previous meeting was way back in Round 2 and it was a very close game. The score was 72-73 in favour of Fenerbahce and Bobby Dixon was a key player in the win, grabbing 15 points. There was also 15 points from Kostas Sloukas but he is injured and will be unavailable for this clash. Fenerbahce have lost three games in a row, which makes life difficult for the side at a time when teams at the top half of the table are looking to build momentum. Bogdan Bogdanovic has offered an average of 13.6 points per game so far this season while Bobby Dixon has offered an average of 11.3 points per game. For Barcelona, the season may be coming to a close in a brighter manner because they have managed to win two games out of two, but the brightest spot will be the fact that the regular season is coming to a close. Tyrese Rice has provided an average of 12.8 points per game while Petteri Koponen has offered an average of 10.3 points per game. Both of these teams have poor offensive records but they are also both in the top five when it comes to defensive records, so this doesn’t look as though it will be a game with a lot of points on offer on Tuesday night in the Euroleague. 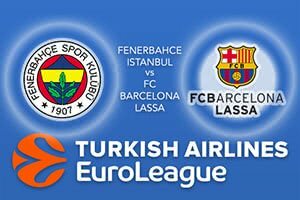 Take FC Barcelona Lass at +8.5 which is provided at odds of 1.90. If you’re looking for the Over/Under market, go UNDER 147.0 which is on offer at odds of 1.90. Bet Now!